No country has ever carried out such extensive projects in the high north, the Russian military leader says in a recap of 2017. It has been a busy year for the Russian defense minister. His Armed Forces have got a big stash of new hardware, military training has been boosted and new facilities built. According to Shoigu, a total of $46 billion, or 2,8 percent of the Russian national budget, has been spent on the military. Since year 2012, the volumes of new modern weaponry has been increased 4-fold, military construction boosted 15-fold, the number of soldiers serving on contracts more than doubled and training activities increased by 30 percent. And the Arctic is a key part of it all, Sergey Shoigu makes clear in an article published in several Russian newspapers, including the vpk-news. According to the minister, a total of 425 buildings with a total surface area of more than 700,000 square meters have been erected on the Russian Arctic islands of Kotelny, Alexandra Land, Wrangel, as well as on the Shmidt peninsula, in the course of the last five years. A total of three huge building complexes, so-called Arctic Trefoils, are erected and in operation, and more than 1,000 soldiers now serve on these sites, Shoigu says. And construction continues, he makes clear. In the course of 2018, the airfield at the Nagurskoye base in Franz Josef Land is to be completed and allow for year-round air operations. Also the runways of Severomorsk-1 in the Kola Peninsula and the Alykel in Norilsk will be completed in the new year. 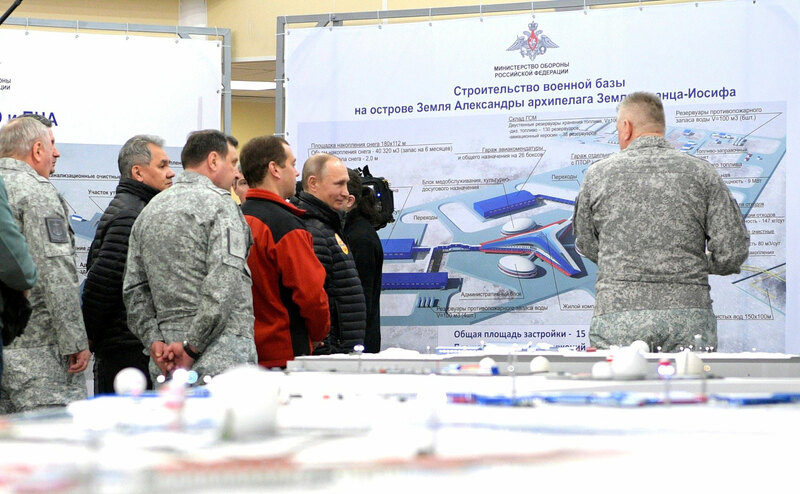 «In the whole history of Arctic development, no other country in the world has carried out such extensive projects in the conditions of the Far North», Shoigu underlines. And new advanced weaponry is soon on its way to the remote bases. The Defense Ministry confirms that the Tor-M2DT, an Arctic version of the Russian short-range surface-to-air missile system, in the course of the year will be applied in the area. The military buildup has a defensive character, Shoigu maintains. «We are not rattling with weapons and do not intend to fight with anyone», he argues. 2017 was also the year when the Russian Armed Forces established the new 14th Army Unit, a part of the Northern Fleet. It is believed that the new unit includes the existing forces of the 80th motorized brigade in Alakurtti and the 200rd in Pechenga, both of them key units under Russia’s so-called Arctic Brigade. The new unit was announced by Shouigu in a meeting in the country’s Ministry Board in April and is aimed at increase management efficiency coastal forces. Similar units have been established in the Baltic and Black Sea Fleets. Also extensive environmental clean-up has been conducted in the region. Ministry forces have removed Soviet.era scrap metal from a more than 100,000 square kilometers area including from Novaya Zemlya, the New Siberian Islands and Wrangel Island, the defense minister says. Only 13,155 square km are no left for clean-up, he maintains. A total of 16,000 tons of rusting metal has been assembled and 10,000 tons shipped out of the area.